Starting out the demo of Sekiro, you’re perched atop a tree, looking down to the feudal Japanese fort below. It’s fitting that you’re perched high up above the ground to kick off the demo, as my one huge impression from playing Sekiro is that the game excels at taking everything you expect about exploring a level in a modern From Software game, and completely throws it out the window by introducing vertical exploration. Almost immediately, you’re assaulting the fort below the tree, making for a great showcase for both the stealth and aforementioned traversal elements in Sekiro. Panning the camera up and down the front of the fort, the true nature of the grappling hook hit me: I saw green dots appearing on tree branches and rooftops, signifying that I could pull myself up there with merely a press of the left trigger. Through just one new mechanic, the entire dynamic of traversal and exploration is changed. Dark Souls and Bloodborne typically featured more horizontal exploration, especially in the case of the former game. You spend the majority of your time in both games moving forwards and backwards, and it’s only really connecting shortcuts between levels that are moving vertically, like the infamously massive ladder under Bloodborne’s Iosefka’s Clinic area. With the grappling hook in Sekiro, all this changes. No longer are we rooted to the ground in this world—we’re instead propelled to rooftops and trees, darting back and forth between ledges with the press of a single button. This is emphasised in a particular section of the demo, where I had to traverse my way down the face of two opposing cliffs, all while being chased by a snake so massive it could wrap itself around Godzilla. 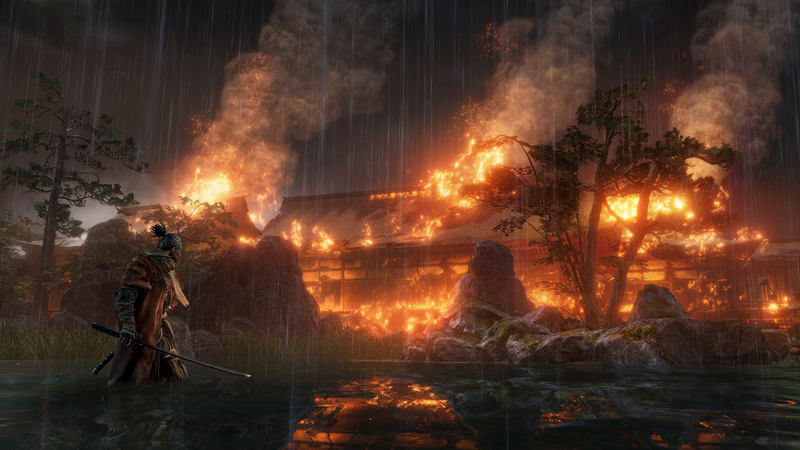 Grappling from cliff edges to outstretched branches with just the right timing to miss the snake was exhilarating, and it proves that Sekiro is something entirely new out of From Software, not just a riff on past formulas of unlocking doors and using lift platforms to get around a complex level. As for the stealth, only the aged Tenchu series bears any proper stealth system. Sure, you can drop down from massive heights and attack an enemy unawares (or while they’re aware of you, hello Taurus Demon), but there’s never been a system that lets you outright avoid an enemy through merely crouching down in tall grass. With Sekiro’s stealth system, you can entirely avoid some combat encounters, or make them a hell of a lot easier by stabbing an enemy in the back before taking them on headfirst in combat. 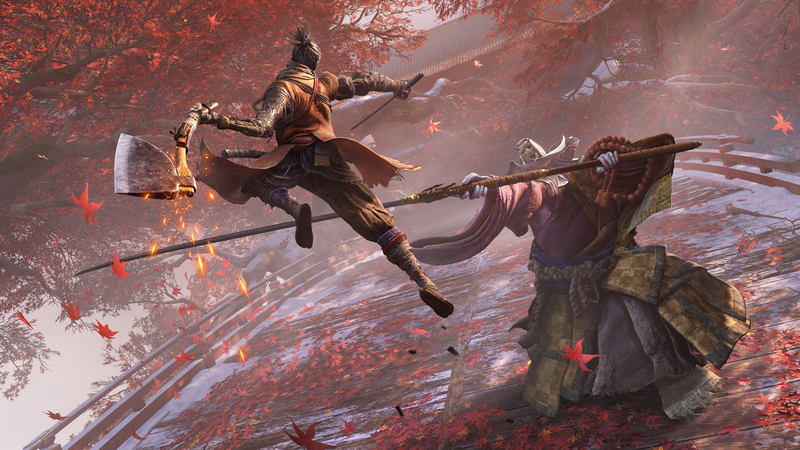 A stealth system might not sound like it mixes things up for Sekiro on paper, but it entirely subverts the way you’d traditionally play a Soulsborne game, which you might think Sekiro is at first glance. The first boss fight of the Sekiro demo, a Samurai General, poses as the first mini boss of the mission, if you can even call this tough-as-nails fight a mini boss. It’s through this fight that I felt the need to put the jump button to the test in combat for the first time, which lets you jump and bounce off of cliff faces and walls. For this boss battle though, you can also jump off enemies themselves, rebounding like a soccer ball into the air, forcing your opponent to undertake defensive measures as you rebound off them into the air. Sekiro throws this jump button into the mix, but it becomes very clear that this isn’t a replacement for your traditional dodge mechanic. If you think that you can jump up into the air and over the swinging blade of an enemy character, you’re going to be cut down to the ground in an instant. It’s interesting that Sekiro introduces the dedicated jump button, but also doesn’t let it function as a dodge mechanic. The jump button is merely there to let you explore vertically, and it’s excellent that it works alongside the traditional dodge move, instead of outright replacing it. You might think you know everything about Sekiro coming into it, if you’ve played Demon’s Souls, Dark Souls, or Bloodborne. But From Software has done away with the rulebook of these past games, adding in a vertical traversal element from the jump, so much so that Sekiro shouldn’t be mistaken for a past From Software venture in any way. We’re not just confined to the ground any more, staring up helplessly at towering enemies. With the grappling hook and a dedicated jump button, From Software is mixing up everything you’d expect out of a Soulsborne game, just in case you thought Sekiro would be an extension of well trodden ground. For more on Sekiro: Shadows Die Twice, check out our everything we know guide for its release date, footage, and more. Tagged with Action,	Analyses,	FromSoftware,	gamescom 2018,	PC,	PlayStation 4,	Xbox One.